The large four outer circles are all approximately 41 feet in diameter; the central circle is 45 feet in diameter with a 19 foot standing centre (with the three small pathways creating a triangular shape; the four smaller circles are all 23 feet in diameter; the long pathways are all 15 feet in length while the shorter pathways are all 8 feet in length. The pathways out to the circles are actually flattened pathways and are part of the formation and were not created by visitors' walking through the formation. There are no tramlines in this field, and when originally first sighted, there were no pathways at all leading into the formation. By the time Mark Boring took his photos, there was a pathway which led from the edge of the field into the circles. The area surrounding Madisonville is quite interesting for a number of reasons. From looking at a topo map, there are quite a few local place names that give some indication of the local geology and environment: Rocky Spring, Hopewell Springs, Tevis Spring, Reed Spring, Sweetwater, etc... Yes, the area is host to many springs! Also, Craighead Caverns is located next to Madisonville, and between Madisonville and Sweetwater is located a registered US Natural National Landmark called "The Lost Sea" which is a 4.5 acre underground lake in a cavern, claimed to be the largest underground lake in the USA. Yes, the whole area is pretty much all limestone! The area surrounding Madisonville is host to many, many archaeological sites, including one, Icehouse Bottom, which has been a habitation site for the past 9,500 year, making it one of the very oldest human habitation sites in Tennessee. Later cultures continued to use the site, and according to James B. Stoltman from the University of Wisconsin-Madison in his paper titled "Icehouse Bottom and the Hopewell Connection", Stoltman presented a revelation that pottery shards found at Icehouse Bottom were characteristic of Ohio Hopewell Pottery, and that pottery discovered from within the Seip Mound and Harness Mound (part of the Liberty Earthworks) both located in the Paint Creek Valley in Ohio had the identical distinctive minerals and grain size as those produced at Icehouse Bottom - showing that over 2,000 years ago, those locations were part of the same extensive trading network. 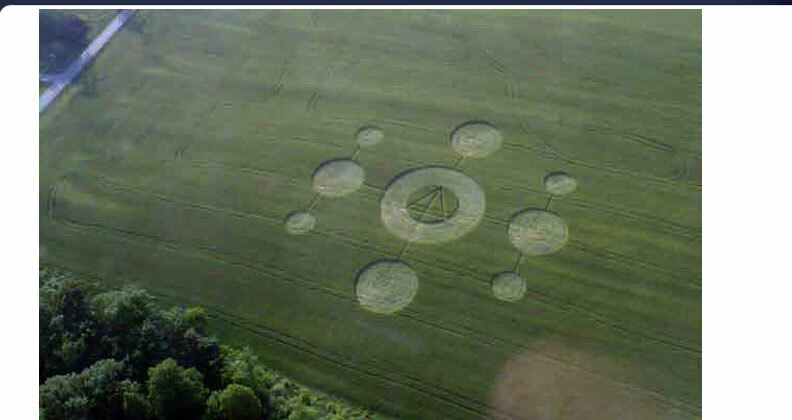 The Madisonville mandala crop formation presents a striking set of circumstances that sheds much light on the nature of the cereal phenomena. 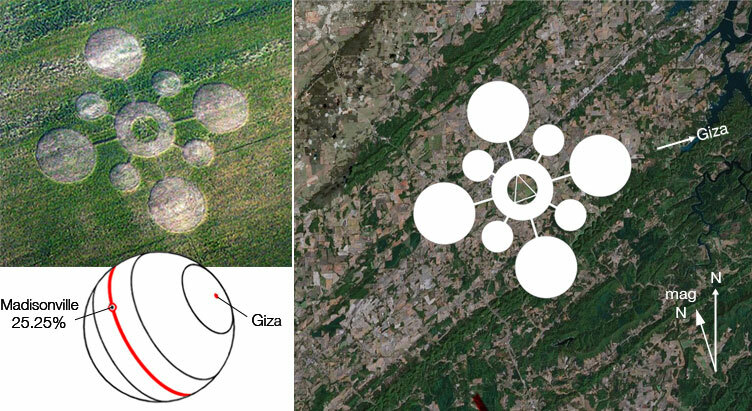 While the nearby indigenous sacred sites reflect the same ancient alignment, the crop formation geometry defines an octagonal matrix linked with the magnetic North pole and the Orion pyramids of Giza, Egypt (presented graphically above). The pyramids are made of limestone - also comprising the Madisonville bedrock - that is mostly calcite, a mineral also acting as a transducer in the human pineal gland. The crop formation reflects the crystallography of calcite, a pattern that has been repeatedly rendered in myriad variations in England and Italy, and again recently in Wilbur, Washington. The Craighead Caverns and The Lost Sea are ancient sacred healing sites powered by the infrasound resonance of the pyramids. 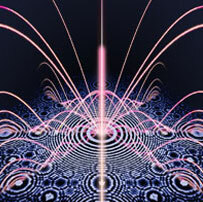 The research shared at this site elucidates the hidden connections linking the global pattern of sacred energy emerging with the rapid onset of magnetic reversal of December 22, 2012 and the new solar age on our planet. Madisonville, Tennessee (35.52°N 84.36°W) lies 6,285 miles from Giza, which is 25.25% of the Earth's mean circumference distance. The high levels of infrasound standing waves focused on the area caused panic and dismay in nearby Knoxville, Tennessee at 1:15am - the Madisonville crop circle was found that same morning of May 14! 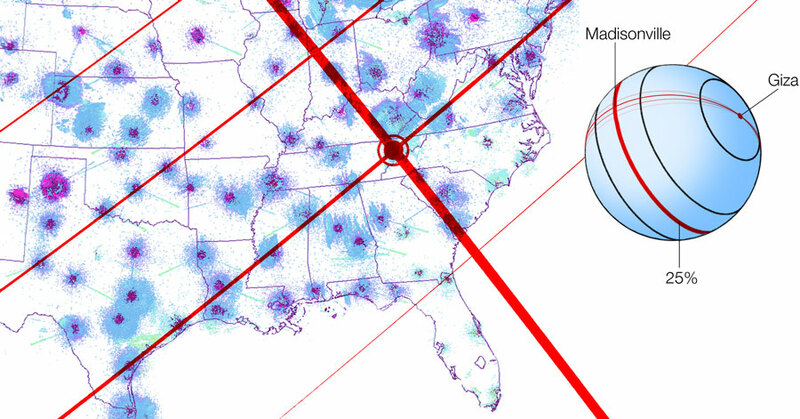 Knoxville lies exactly 25.0% of the Earth's circumference from Giza. Identical rumbling infrasound tremors have also been observed in Richmond, Virginia and Wilmington, North Carolina. Another identical event was reported in Klai, Vietnam at 20.0% distance from Giza. Similar infrasound resonance has been reported in Atwater and Vallejo, California exactly 30.00% of the Earth's circumference from Giza. These sites exquisitely show the sacred geometric relationship 2:3:5, now called the Fibonacci proportion. The extreme precision of the distances of these infrasound anomalies to the Pyramids of Giza establishes a geometric relationship beyond any doubt - directly confirming the theory of magnetic resonance. This same effect is simultaneously occurring with waves of piezoelectric firestorms in Ratria, India, Messina, Italy, Bodibe, South Africa, Seattle and Santa Barbara, USA.